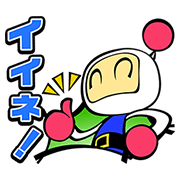 http://www.line-stickers.com/ – SUPER BOMBERMAN Ｒ Line Sticker | Bombs away! The newest entry in the Bomberman series, Super Bomberman R, is here with its own sticker set. With this unique cast of Bombermen (and Bomberwomen! ), you’ll make your chats explode with fun in no time! Next post MYDEERDOG’s Got Moves!